Brands are a legacy, they outlive people and products. Gone are the days when brand building was solely based on the conjuring power of the brand custodian’s wand. Such palaces in the air were bound to vanish soon when the unforgiving light of reality fell on them. There are many brands which based their existence solely on marketing, advertising, PR, even with regular page 3 presence. They had all died their natural deaths. It is a very common notion that Building Brand means creating something from nothing. On the contrary, it is creating something out of a very solid foundation of truth and honesty. A brand is built on trust. Brand is a promise that the product or service will perform or deliver as per expectations of its stakeholders. Branding unlike sales does not cater to only clients but has a bigger picture in mind. It is not about its client list but about the perception that one wants to create in the overall scheme of things. Let us first spend some time contemplating on a very critical term in branding – brand promise. Why customers need to trust a brand and stick to it is because it lives up to the brand promise. For example, Britannia’s Eat Healthy Think Better promise. If now they start manufacturing cold drinks and potato chips, they will lose their customers. So whatever brand extension they get into they need to be in the ‘healthy’ segment, no matter what the opportunity cost loss to business is. So the glue will be how one delivers and lives up to the promise to the customers and stakeholders. Another example is FedEx’s promise ‘When it absolutely, positively, has to be there overnight’. So small wonder, if it fails to deliver overnight no matter what you communicate, the customers will not trust its promise anymore. For establishing a brand one needs to dwell with the intangibles such as trust or innovation or efficiency or transparency and similar attributes. And over the years the brand will grow beyond its list of clients and prospects with the desired associations. We, brand custodians, are still story tellers, we still have our wands to weave magic. What we need to additionally work on is to convince the management the criticality of keeping promises. Identify the brand promise: While in some organisations the brand promise is part of the mission statement, in most it is not spelt out. It becomes very difficult to then identity one promise that the brand needs to make to its shareholders to establish its credibility. A custodian has a tough task in hand, but this forms the foundation of the brand that one needs to build. See whether the strategic objective is in line with the promise: While promise primarily reflects the mission of the organisation, it is important to understand the strategic objective of the company, which is more in line with its business objectives. The brand custodian needs to find the synergy between the two so that the efforts taken to build the brand and establish the promise lead to business. In case there is clear synergy it is not a problem, when there isn’t, the promise as well as strategy needs to be revisited to establish the synergy. Identify the target stakeholders of the promise: This is a critical step as the custodian needs to identity who are the recipients of the brand promise – it can be customers, it can be promoters, it can be shareholders, it can be employees, and the likes. Unless there is clarity in the recipient list of the promise no brand communication can be effective. Identify the channels of brand communication: This is the most important step where we need to use our wand. We have the promise, we have the target and so it needs our magic to creatively craft communications for generating the desired impact. 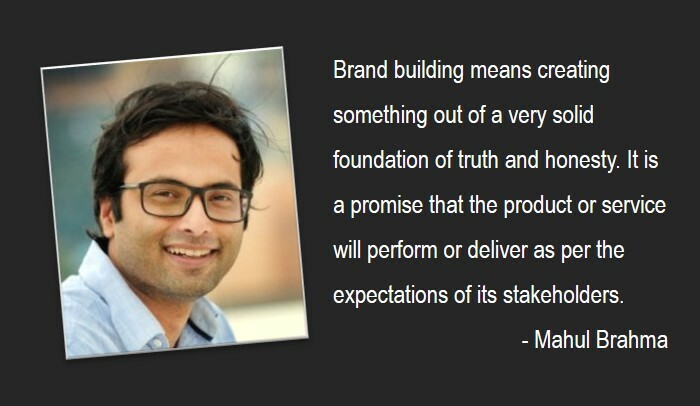 Every brand communication needs to showcase the promise, either explicitly or via brand attributes that enable the organisation to keep its promise. Communicate, communicate and communicate: Once you are ready with all the ammo and you have trust in your promise, just keep communicating using every channel available. Social media has become the most powerful channel today. A simple tweet can make or break reputation today. So be aware of the noise that is generated on social media before it turns into a crisis. Use social media with full gusto for sharing stories where the organisation has lived up to its promise. Over years, the brand will be established as a trust-worthy brand with all the desired attributes. As Frost rightly says no matter how effective your brand communication is, it has to walk the talk, keep the promises – it has miles to go before it sleeps.